By Charles Boehm - WASHINGTON, DC (Jan 28, 2015) US Soccer Players - Perhaps it's appropriate that in 2015, the year in which the second installment of the famous movie trilogy is set, the USMNT are going Back to the Future. If widespread reports out of the current USMNT camp are correct, coach Jurgen Klinsmann has been testing out a three-man back line, ostensibly as the base for a 3-5-2 formation. 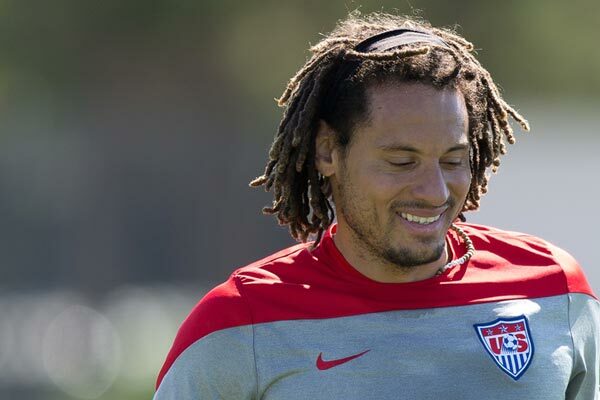 Anchored by converted midfielder Jermaine Jones in the central defender's spot, this new look would mark a significant departure from the shapes employed not only under Klinsmann, but his predecessor Bob Bradley. We might get to see it debut vs. Chile in the mining city of Rancagua on Wednesday evening (6pm ET - Fox Sports 1). It's a calculated gamble by most any measure. Four in the back is generally perceived to be hard-wired into the American soccer brain, in many ways even more so than the often-cited comfort with two strikers. However, it's hardly new to the program. A few of the USMNT's greatest-ever performances have been achieved with a three-man defense. Facing a Round-of-16 grudge match vs Mexico on short rest during the 2002 World Cup, Bruce Arena fielded a 3-5-2 designed to soak up pressure and hit El Tri on the counter. The plan worked to perfection in the landmark 2-0 victory. Brian McBride and Landon Donovan delivered brilliantly-taken goals. The back three of Greg Berhalter, Eddie Pope, and Tony Sanneh were just as influential. The Yanks had to weather plenty of probing possession by Mexico. Rewind a few more years to another famous performance, the USMNT's stunning run to the semifinals of the 1995 Copa America. There, you'll find three in the back yet again. That time it was Paul Caligiuri, Marcelo Balboa, and Alexi Lalas anchoring the rearguard resistance as coach Steve Sampson unveiled a unique 3-6-1 shape. With the razor-sharp Eric Wynalda up top and deep-lying duo of John Harkes and Thomas Dooley pulling the strings, the Yanks knocked off Argentina and Chile to take first place in Group C. The USMNT edged Mexico in the knockout stages before a narrow semifinal loss to Brazil. The midfield structure – simultaneously clogged and blessed with width – confounded the opposition so effectively that Sampson turned to the formula at the 1998 World Cup, only with much poorer results for a number of reasons. Playing with three defenders requires a reserve of fit, adventurous wide players and a high level of collective tactical intelligence. That's especially true in a National Team environment where players must mesh quickly in a setup significantly different from what they experience at club level. With the back three required to communicate and keep their shape at all times, it will place much on the shoulders of Jones, whose move to defense is still a new development. Chile provides an appropriate opponent for Klinsmann's return to this concept. They play a similar system, instituted by former manager Marcelo Bielsa. The iconic Argentine's magnetic personality and high-paced, high-pressing philosophy has made him something of a cult hero around the world. If the rumors are true, a few years ago he very nearly got a chance to lead the USMNT in much the same broad tasking as the one handed to Klinsmann. Bielsa instilled “La Roja” with an energy, intensity and aggressive desire to attack that made them a surprise hit at the 2010 World Cup. Current coach Jorge Sampaoli has cultivated that mentality since taking the reins in 2013. Pressing high up the pitch, Chile push the tempo, hunt in packs, and look for quick passing combinations to slash apart opposing defenses. The influence of these ideas are evident in the recent evolution of highly successful teams like Bayern Munich and current world champions Germany. It will be fascinating to see how the current US squad might respond to such a setup. Given their adversaries' deep familiarity with the system, Wednesday's match might easily spin out of control for an experimental USMNT. If Klinsmann takes a patient, committed approach, the long-term results could prove revolutionary. DaMarcus Beasley on Jozy, Landon, media, and retirement: "My priorities are different now"